We Are a Dry Eye Center of Excellence! The physicians at Medical Center Eye Clinic understand the daily challenges many of our patients face due to dry eyes. A common condition, dry eye syndrome occurs either when the eyes fail to produce adequate tears or when the tears evaporate too quickly. Patients with dry eye syndrome may suffer from redness, irritation, burning, blurry vision or, strangely enough, tearing. Moreover, patients will often experience a foreign body sensation, the feeling like that of having an eyelash in the eye. These symptoms can be exacerbated by certain inflammatory disease processes, medications, or environments. Chronic dry eye syndrome can lead to a decreased quality of vision and in the most severe cases may cause irreversible damage. 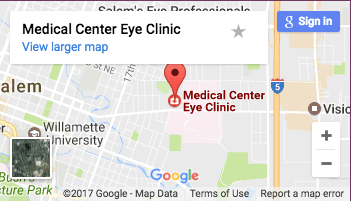 Medical Center Eye Clinic is proud to be a certified Dry Eye Center of Excellence. Our team is dedicated to taking the time and using every resource at our disposal to create a treatment plan specific to each individual’s needs. The tear film is the frontmost layer of the eye, and is actually a three-layered structure composed of mucin on the bottom adjacent to the cornea (the clear window on the front of the eye); the watery layer in the middle; and a thin oily layer on the outside. All three layers must be present in normal quality and quantity for the tear film to function properly. In fact, though, most cases of dry eye are the result of an age-related loss of the microscopic tear glands that reside in the eyelid margin. Dry eye is more common in women, and more common in all of us as we age. Management of dry eye requires understanding of the anatomy and physiology of the tear film and how it is affected by the disease processes that cause it. Treatment ranges all the way from the use of artificial tears to tear drainage system plugs, with many options in between. A combination of these two types, with the possibility of mucin deficiency that prevents the tear film from adhering properly to the cornea. eye fatigue, especially with reading. Dry eye syndrome is very common, but can be caused by many different processes. If left untreated, it can decrease the quality of vision and quality of life. However, with a careful examination and tailored treatment regimen, dry eyes can be effectively managed.